One of the best ice skating rinks in Sydney, NS, Whitney Pier Ice Skating Rink is a 1 sheet indoor ice skating rink is open year round. It was founded in 1967. Public Skating Ice skating sessions for All Ages are one of the main attractions at Whitney Pier. Ice Skating provides great exercise and an opportunity to get out of the house – plus, it is not like exercising at the gym… skating is fun! Lace-em up and come join the others. Get on the ice and get ready for a great experience. If you do not see the rinks public ice skating schedule posted, be sure to contact them at (902) 539-6735 for their public session times. And please tell them that you saw them on RinkTime. And remind them to keep their schedule updated on the site. Ice Hockey Leagues Whitney Pier Ice Skating Rink offers ice hockey leagues for all ages. Whether you are a beginning skater looking to play on a team in an instructional league or an experienced ice hockey player looking to get out and play with others of a similar caliber, Whitney Pier Ice Skating Rink is the place to play. Give them a call at (902) 539-6735 to inquire about their leagues now. The experienced group will help get you ready for your next game Leagues and levels include: Adult,Youth. Ice Hockey Camps and Clinics With the exception of private lessons, the best way to increase your hockey skills is to do drills and exercises that build on the fundamentals. Even better is to do those drills while supervised by someone who understands how to do things properly and can correct you when you are doing them wrong. When playing, everyone feels like they are NHL ready, but very few really look or play that way. Whitney Pier Ice Skating Rink offers camps and clinics for all ages.to help you improve your game. Call Whitney Pier at (902) 539-6735 to learn when their next ice hockey camp or clinic is being held. Pickup Hockey on Ice Looking for a casual game of hockey? Whitney Pier Ice Skating Rink offers pickup ice hockey for all ages.Give Whitney Pier a call at (902) 539-6735 to inquire about their pickup hockey schedule if it is not listed in the description or schedule here. Broom Ball Whitney Pier offers Broomball. Many people do not know this, but Broomball is an actual competitive sport. It is similar to ice hockey – it is fast and fun. If you are looking to rent the ice for a group to play broomball or you are just interested in giving it a try, give them a call now at (902) 539-6735. Birthday Party or Event Planning? Why not have your party or event at Whitney Pier? They can make their rink and other facilities available to you for birthday parties, holiday parties or corporate events. Their prices are great. They would love to have you out. Give them a call if you would like to schedule your event now at (902) 539-6735. Please call at least one week in advance to properly schedule your event. Snack Bar Got the munchies? Whitney Pier provides food and beverages in the snack bar. One of the best ice skating rinks in Halifax, NS, Halifax Forum (Civic Centre) Ice Skating Rink is a 2 sheet indoor ice skating rink is open year round. It was founded in 1927. Public Skating Ice skating sessions for All Ages are one of the main attractions at Halifax Forum (Civic Centre). Ice Skating provides great exercise and an opportunity to get out of the house – plus, it is not like exercising at the gym… skating is fun! Lace-em up and come join the others. Get on the ice and get ready for a great experience. If you do not see the rinks public ice skating schedule posted, be sure to contact them at (902) 490-4614 for their public session times. And please tell them that you saw them on RinkTime. And remind them to keep their schedule updated on the site. Figure & Ice Skating Lessons. Are you an adult looking to learn to ice skate? Do you have children yearning to ice skate like the pros? If so, the folks here love to teach and their instructors are top notch. For beginners they usually focus on providing the basics. For more advanced skaters they focus on proper form, technique and getting you ready to meet your goals. Call Halifax Forum (Civic Centre) at (902) 490-4614 for more details. Ice Hockey Leagues Halifax Forum (Civic Centre) Ice Skating Rink offers ice hockey leagues for all ages. Whether you are a beginning skater looking to play on a team in an instructional league or an experienced ice hockey player looking to get out and play with others of a similar caliber, Halifax Forum (Civic Centre) Ice Skating Rink is the place to play. Give them a call at (902) 490-4614 to inquire about their leagues now. The experienced group will help get you ready for your next game Leagues and levels include: Adult,Youth,High School,Collegiate. Ice Hockey Tournaments What better way to see how you and your team stacks up than to play against teams outside your normal leagues? Halifax Forum (Civic Centre) Ice Skating Rink hosts ice hockey tournaments forall ages.at their facilities. Call Halifax Forum (Civic Centre) at (902) 490-4614 for more details and to look into upcoming tournaments. Ice Hockey Camps and Clinics With the exception of private lessons, the best way to increase your hockey skills is to do drills and exercises that build on the fundamentals. Even better is to do those drills while supervised by someone who understands how to do things properly and can correct you when you are doing them wrong. When playing, everyone feels like they are NHL ready, but very few really look or play that way. Halifax Forum (Civic Centre) Ice Skating Rink offers camps and clinics for all ages.to help you improve your game. Call Halifax Forum (Civic Centre) at (902) 490-4614 to learn when their next ice hockey camp or clinic is being held. Pickup Hockey on Ice Looking for a casual game of hockey? Halifax Forum (Civic Centre) Ice Skating Rink offers pickup ice hockey for all ages.Give Halifax Forum (Civic Centre) a call at (902) 490-4614 to inquire about their pickup hockey schedule if it is not listed in the description or schedule here. Broom Ball Halifax Forum (Civic Centre) offers Broomball. Many people do not know this, but Broomball is an actual competitive sport. It is similar to ice hockey – it is fast and fun. If you are looking to rent the ice for a group to play broomball or you are just interested in giving it a try, give them a call now at (902) 490-4614. Birthday Party or Event Planning? Why not have your party or event at Halifax Forum (Civic Centre)? They can make their rink and other facilities available to you for birthday parties, holiday parties or corporate events. Their prices are great. They would love to have you out. Give them a call if you would like to schedule your event now at (902) 490-4614. Please call at least one week in advance to properly schedule your event. Snack Bar Got the munchies? Halifax Forum (Civic Centre) provides food and beverages in the snack bar. One of the best ice skating rinks in Saint Margaret Village, NS, Northern Victoria Community Centre Ice Skating Rink is a 1 sheet indoor ice skating rink is open seasonally. It was founded in 1980. Public Skating Ice skating sessions for All Ages are one of the main attractions at Northern Victoria Community Centre. Ice Skating provides great exercise and an opportunity to get out of the house – plus, it is not like exercising at the gym… skating is fun! Lace-em up and come join the others. Get on the ice and get ready for a great experience. If you do not see the rinks public ice skating schedule posted, be sure to contact them at (902) 383-2515 for their public session times. And please tell them that you saw them on RinkTime. And remind them to keep their schedule updated on the site. Figure & Ice Skating Lessons. Are you an adult looking to learn to ice skate? Do you have children yearning to ice skate like the pros? If so, the folks here love to teach and their instructors are top notch. For beginners they usually focus on providing the basics. For more advanced skaters they focus on proper form, technique and getting you ready to meet your goals. Call Northern Victoria Community Centre at (902) 383-2515 for more details. Ice Hockey Leagues Northern Victoria Community Centre Ice Skating Rink offers ice hockey leagues for all ages. Whether you are a beginning skater looking to play on a team in an instructional league or an experienced ice hockey player looking to get out and play with others of a similar caliber, Northern Victoria Community Centre Ice Skating Rink is the place to play. Give them a call at (902) 383-2515 to inquire about their leagues now. The experienced group will help get you ready for your next game Leagues and levels include: Adult,Youth. Ice Hockey Tournaments What better way to see how you and your team stacks up than to play against teams outside your normal leagues? Northern Victoria Community Centre Ice Skating Rink hosts ice hockey tournaments forall ages.at their facilities. Call Northern Victoria Community Centre at (902) 383-2515 for more details and to look into upcoming tournaments. Ice Hockey Camps and Clinics With the exception of private lessons, the best way to increase your hockey skills is to do drills and exercises that build on the fundamentals. Even better is to do those drills while supervised by someone who understands how to do things properly and can correct you when you are doing them wrong. When playing, everyone feels like they are NHL ready, but very few really look or play that way. Northern Victoria Community Centre Ice Skating Rink offers camps and clinics for all ages.to help you improve your game. Call Northern Victoria Community Centre at (902) 383-2515 to learn when their next ice hockey camp or clinic is being held. Broom Ball Northern Victoria Community Centre offers Broomball. Many people do not know this, but Broomball is an actual competitive sport. It is similar to ice hockey – it is fast and fun. If you are looking to rent the ice for a group to play broomball or you are just interested in giving it a try, give them a call now at (902) 383-2515. Birthday Party or Event Planning? Why not have your party or event at Northern Victoria Community Centre? They can make their rink and other facilities available to you for birthday parties, holiday parties or corporate events. Their prices are great. They would love to have you out. Give them a call if you would like to schedule your event now at (902) 383-2515. Please call at least one week in advance to properly schedule your event. Snack Bar Got the munchies? Northern Victoria Community Centre provides food and beverages in the snack bar. One of the best ice skating rinks in Stellarton, NS, Stellarton Memorial Arena Ice Skating Rink is a 1 sheet indoor ice skating rink is open seasonally. It was founded in 1958. Public Skating Ice skating sessions for All Ages are one of the main attractions at Stellarton Memorial Arena. Ice Skating provides great exercise and an opportunity to get out of the house – plus, it is not like exercising at the gym… skating is fun! Lace-em up and come join the others. Get on the ice and get ready for a great experience. If you do not see the rinks public ice skating schedule posted, be sure to contact them at (902) 752-2946 for their public session times. And please tell them that you saw them on RinkTime. And remind them to keep their schedule updated on the site. Figure & Ice Skating Lessons. Are you an adult looking to learn to ice skate? Do you have children yearning to ice skate like the pros? If so, the folks here love to teach and their instructors are top notch. For beginners they usually focus on providing the basics. For more advanced skaters they focus on proper form, technique and getting you ready to meet your goals. Call Stellarton Memorial Arena at (902) 752-2946 for more details. Ice Hockey Leagues Stellarton Memorial Arena Ice Skating Rink offers ice hockey leagues for all ages. Whether you are a beginning skater looking to play on a team in an instructional league or an experienced ice hockey player looking to get out and play with others of a similar caliber, Stellarton Memorial Arena Ice Skating Rink is the place to play. Give them a call at (902) 752-2946 to inquire about their leagues now. The experienced group will help get you ready for your next game Leagues and levels include: Adult,Youth. Ice Hockey Camps and Clinics With the exception of private lessons, the best way to increase your hockey skills is to do drills and exercises that build on the fundamentals. Even better is to do those drills while supervised by someone who understands how to do things properly and can correct you when you are doing them wrong. When playing, everyone feels like they are NHL ready, but very few really look or play that way. Stellarton Memorial Arena Ice Skating Rink offers camps and clinics for all ages.to help you improve your game. Call Stellarton Memorial Arena at (902) 752-2946 to learn when their next ice hockey camp or clinic is being held. Birthday Party or Event Planning? Why not have your party or event at Stellarton Memorial Arena? They can make their rink and other facilities available to you for birthday parties, holiday parties or corporate events. Their prices are great. They would love to have you out. Give them a call if you would like to schedule your event now at (902) 752-2946. Please call at least one week in advance to properly schedule your event. Snack Bar Got the munchies? Stellarton Memorial Arena provides food and beverages in the snack bar. One of the best ice skating rinks in Berwick, NS, Berwick Arena Ice Skating Rink is a 1 sheet indoor ice skating rink is open seasonally. It was founded in 1967. Public Skating Ice skating sessions for All Ages are one of the main attractions at Berwick Arena. Ice Skating provides great exercise and an opportunity to get out of the house – plus, it is not like exercising at the gym… skating is fun! Lace-em up and come join the others. Get on the ice and get ready for a great experience. If you do not see the rinks public ice skating schedule posted, be sure to contact them at (902) 538-9070 for their public session times. And please tell them that you saw them on RinkTime. And remind them to keep their schedule updated on the site. Ice Hockey Leagues Berwick Arena Ice Skating Rink offers ice hockey leagues for all ages. Whether you are a beginning skater looking to play on a team in an instructional league or an experienced ice hockey player looking to get out and play with others of a similar caliber, Berwick Arena Ice Skating Rink is the place to play. Give them a call at (902) 538-9070 to inquire about their leagues now. The experienced group will help get you ready for your next game Leagues and levels include: Adult,Youth,High School. Ice Hockey Tournaments What better way to see how you and your team stacks up than to play against teams outside your normal leagues? Berwick Arena Ice Skating Rink hosts ice hockey tournaments forall ages.at their facilities. Call Berwick Arena at (902) 538-9070 for more details and to look into upcoming tournaments. Ice Hockey Camps and Clinics With the exception of private lessons, the best way to increase your hockey skills is to do drills and exercises that build on the fundamentals. Even better is to do those drills while supervised by someone who understands how to do things properly and can correct you when you are doing them wrong. When playing, everyone feels like they are NHL ready, but very few really look or play that way. Berwick Arena Ice Skating Rink offers camps and clinics for all ages.to help you improve your game. Call Berwick Arena at (902) 538-9070 to learn when their next ice hockey camp or clinic is being held. Pickup Hockey on Ice Looking for a casual game of hockey? Berwick Arena Ice Skating Rink offers pickup ice hockey for all ages.Give Berwick Arena a call at (902) 538-9070 to inquire about their pickup hockey schedule if it is not listed in the description or schedule here. Broom Ball Berwick Arena offers Broomball. Many people do not know this, but Broomball is an actual competitive sport. It is similar to ice hockey – it is fast and fun. If you are looking to rent the ice for a group to play broomball or you are just interested in giving it a try, give them a call now at (902) 538-9070. Birthday Party or Event Planning? Why not have your party or event at Berwick Arena? They can make their rink and other facilities available to you for birthday parties, holiday parties or corporate events. Their prices are great. They would love to have you out. Give them a call if you would like to schedule your event now at (902) 538-9070. Please call at least one week in advance to properly schedule your event. Snack Bar Got the munchies? Berwick Arena provides food and beverages in the snack bar. Visit our Pro Shop If your are looking for new ice hockey, figure and other skating equipment or services, Berwick Arena can help. The Berwick Arena pro shop offers a wide array of products and services. Stop by for a visit next time you are at the rink or contact them now at (902) 538-9070 to see if they have what you are looking for. One of the best ice skating rinks in Stellarton, NS, Stellarton Memorial Rink Ice Skating Rink is a 1 sheet outdoor ice skating rink is open seasonally. Public Skating Ice skating sessions for All Ages are one of the main attractions at Stellarton Memorial Rink. Ice Skating provides great exercise and an opportunity to get out of the house – plus, it is not like exercising at the gym… skating is fun! Lace-em up and come join the others. Get on the ice and get ready for a great experience. If you do not see the rinks public ice skating schedule posted, be sure to contact them at (902) 752-8944 for their public session times. And please tell them that you saw them on RinkTime. And remind them to keep their schedule updated on the site. Figure & Ice Skating Lessons. Are you an adult looking to learn to ice skate? Do you have children yearning to ice skate like the pros? If so, the folks here love to teach and their instructors are top notch. For beginners they usually focus on providing the basics. For more advanced skaters they focus on proper form, technique and getting you ready to meet your goals. Call Stellarton Memorial Rink at (902) 752-8944 for more details. Ice Hockey Leagues Stellarton Memorial Rink Ice Skating Rink offers ice hockey leagues for all ages. 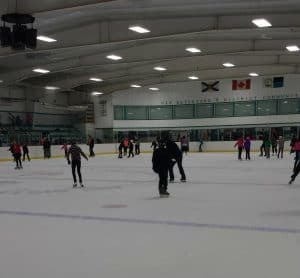 Whether you are a beginning skater looking to play on a team in an instructional league or an experienced ice hockey player looking to get out and play with others of a similar caliber, Stellarton Memorial Rink Ice Skating Rink is the place to play. Give them a call at (902) 752-8944 to inquire about their leagues now. The experienced group will help get you ready for your next game Leagues and levels include: Adult,Youth. Ice Hockey Tournaments What better way to see how you and your team stacks up than to play against teams outside your normal leagues? Stellarton Memorial Rink Ice Skating Rink hosts ice hockey tournaments forall ages.at their facilities. Call Stellarton Memorial Rink at (902) 752-8944 for more details and to look into upcoming tournaments. Ice Hockey Camps and Clinics With the exception of private lessons, the best way to increase your hockey skills is to do drills and exercises that build on the fundamentals. Even better is to do those drills while supervised by someone who understands how to do things properly and can correct you when you are doing them wrong. When playing, everyone feels like they are NHL ready, but very few really look or play that way. Stellarton Memorial Rink Ice Skating Rink offers camps and clinics for all ages.to help you improve your game. Call Stellarton Memorial Rink at (902) 752-8944 to learn when their next ice hockey camp or clinic is being held. Pickup Hockey on Ice Looking for a casual game of hockey? Stellarton Memorial Rink Ice Skating Rink offers pickup ice hockey for all ages.Give Stellarton Memorial Rink a call at (902) 752-8944 to inquire about their pickup hockey schedule if it is not listed in the description or schedule here. Birthday Party or Event Planning? Why not have your party or event at Stellarton Memorial Rink? They can make their rink and other facilities available to you for birthday parties, holiday parties or corporate events. Their prices are great. They would love to have you out. Give them a call if you would like to schedule your event now at (902) 752-8944. Please call at least one week in advance to properly schedule your event. Snack Bar Got the munchies? Stellarton Memorial Rink provides food and beverages in the snack bar. One of the best ice skating rinks in Lunenburg, NS, Lunenburg Community Centre Arena Ice Skating Rink is a 1 sheet indoor ice skating rink is open seasonally. It was founded in 1928. Public Skating Ice skating sessions for All Ages are one of the main attractions at Lunenburg Community Centre Arena . Ice Skating provides great exercise and an opportunity to get out of the house – plus, it is not like exercising at the gym… skating is fun! Lace-em up and come join the others. Get on the ice and get ready for a great experience. If you do not see the rinks public ice skating schedule posted, be sure to contact them at (902) 634-8744 for their public session times. And please tell them that you saw them on RinkTime. And remind them to keep their schedule updated on the site. Figure & Ice Skating Lessons. Are you an adult looking to learn to ice skate? Do you have children yearning to ice skate like the pros? If so, the folks here love to teach and their instructors are top notch. For beginners they usually focus on providing the basics. For more advanced skaters they focus on proper form, technique and getting you ready to meet your goals. Call Lunenburg Community Centre Arena at (902) 634-8744 for more details. Ice Hockey Leagues Lunenburg Community Centre Arena Ice Skating Rink offers ice hockey leagues for all ages. Whether you are a beginning skater looking to play on a team in an instructional league or an experienced ice hockey player looking to get out and play with others of a similar caliber, Lunenburg Community Centre Arena Ice Skating Rink is the place to play. Give them a call at (902) 634-8744 to inquire about their leagues now. The experienced group will help get you ready for your next game Leagues and levels include: Adult,Youth,High School,Collegiate. Ice Hockey Tournaments What better way to see how you and your team stacks up than to play against teams outside your normal leagues? Lunenburg Community Centre Arena Ice Skating Rink hosts ice hockey tournaments forall ages.at their facilities. Call Lunenburg Community Centre Arena at (902) 634-8744 for more details and to look into upcoming tournaments. Ice Hockey Camps and Clinics With the exception of private lessons, the best way to increase your hockey skills is to do drills and exercises that build on the fundamentals. Even better is to do those drills while supervised by someone who understands how to do things properly and can correct you when you are doing them wrong. When playing, everyone feels like they are NHL ready, but very few really look or play that way. Lunenburg Community Centre Arena Ice Skating Rink offers camps and clinics for all ages.to help you improve your game. Call Lunenburg Community Centre Arena at (902) 634-8744 to learn when their next ice hockey camp or clinic is being held. Pickup Hockey on Ice Looking for a casual game of hockey? Lunenburg Community Centre Arena Ice Skating Rink offers pickup ice hockey for all ages.Give Lunenburg Community Centre Arena a call at (902) 634-8744 to inquire about their pickup hockey schedule if it is not listed in the description or schedule here. Birthday Party or Event Planning? Why not have your party or event at Lunenburg Community Centre Arena ? They can make their rink and other facilities available to you for birthday parties, holiday parties or corporate events. Their prices are great. They would love to have you out. Give them a call if you would like to schedule your event now at (902) 634-8744. Please call at least one week in advance to properly schedule your event. Snack Bar Got the munchies? Lunenburg Community Centre Arena provides food and beverages in the snack bar. One of the best ice skating rinks in New Waterford, NS, New Waterford & District Community Center Ice Skating Rink is a 1 sheet indoor ice skating rink is open seasonally. It was founded in 4793. Public Skating Ice skating sessions for All Ages are one of the main attractions at New Waterford & District Community Center. Ice Skating provides great exercise and an opportunity to get out of the house – plus, it is not like exercising at the gym… skating is fun! Lace-em up and come join the others. Get on the ice and get ready for a great experience. If you do not see the rinks public ice skating schedule posted, be sure to contact them at 1-902-862-6031 for their public session times. And please tell them that you saw them on RinkTime. And remind them to keep their schedule updated on the site. Figure & Ice Skating Lessons. Are you an adult looking to learn to ice skate? Do you have children yearning to ice skate like the pros? If so, the folks here love to teach and their instructors are top notch. For beginners they usually focus on providing the basics. For more advanced skaters they focus on proper form, technique and getting you ready to meet your goals. Call New Waterford & District Community Center at 1-902-862-6031 for more details. Ice Hockey Leagues New Waterford & District Community Center Ice Skating Rink offers ice hockey leagues for all ages. Whether you are a beginning skater looking to play on a team in an instructional league or an experienced ice hockey player looking to get out and play with others of a similar caliber, New Waterford & District Community Center Ice Skating Rink is the place to play. Give them a call at 1-902-862-6031 to inquire about their leagues now. The experienced group will help get you ready for your next game Leagues and levels include: Adult,Youth,High School. Ice Hockey Tournaments What better way to see how you and your team stacks up than to play against teams outside your normal leagues? New Waterford & District Community Center Ice Skating Rink hosts ice hockey tournaments forall ages.at their facilities. Call New Waterford & District Community Center at 1-902-862-6031 for more details and to look into upcoming tournaments. Ice Hockey Camps and Clinics With the exception of private lessons, the best way to increase your hockey skills is to do drills and exercises that build on the fundamentals. Even better is to do those drills while supervised by someone who understands how to do things properly and can correct you when you are doing them wrong. When playing, everyone feels like they are NHL ready, but very few really look or play that way. New Waterford & District Community Center Ice Skating Rink offers camps and clinics for all ages.to help you improve your game. Call New Waterford & District Community Center at 1-902-862-6031 to learn when their next ice hockey camp or clinic is being held. Pickup Hockey on Ice Looking for a casual game of hockey? New Waterford & District Community Center Ice Skating Rink offers pickup ice hockey for all ages.Give New Waterford & District Community Center a call at 1-902-862-6031 to inquire about their pickup hockey schedule if it is not listed in the description or schedule here. Birthday Party or Event Planning? Why not have your party or event at New Waterford & District Community Center? They can make their rink and other facilities available to you for birthday parties, holiday parties or corporate events. Their prices are great. They would love to have you out. Give them a call if you would like to schedule your event now at 1-902-862-6031. Please call at least one week in advance to properly schedule your event. Snack Bar Got the munchies? New Waterford & District Community Center provides food and beverages in the snack bar. One of the best ice skating rinks in Pictou, NS, Hector Arena Ice Skating Rink is a 1 sheet indoor ice skating rink is open seasonally. It was founded in 1972. Public Skating Ice skating sessions for All Ages are one of the main attractions at Hector Arena. Ice Skating provides great exercise and an opportunity to get out of the house – plus, it is not like exercising at the gym… skating is fun! Lace-em up and come join the others. Get on the ice and get ready for a great experience. If you do not see the rinks public ice skating schedule posted, be sure to contact them at (902) 485-5122 for their public session times. And please tell them that you saw them on RinkTime. And remind them to keep their schedule updated on the site. Figure & Ice Skating Lessons. Are you an adult looking to learn to ice skate? Do you have children yearning to ice skate like the pros? If so, the folks here love to teach and their instructors are top notch. For beginners they usually focus on providing the basics. For more advanced skaters they focus on proper form, technique and getting you ready to meet your goals. Call Hector Arena at (902) 485-5122 for more details. Ice Hockey Leagues Hector Arena Ice Skating Rink offers ice hockey leagues for all ages. Whether you are a beginning skater looking to play on a team in an instructional league or an experienced ice hockey player looking to get out and play with others of a similar caliber, Hector Arena Ice Skating Rink is the place to play. Give them a call at (902) 485-5122 to inquire about their leagues now. The experienced group will help get you ready for your next game Leagues and levels include: Adult,Youth,High School. Ice Hockey Tournaments What better way to see how you and your team stacks up than to play against teams outside your normal leagues? Hector Arena Ice Skating Rink hosts ice hockey tournaments forall ages.at their facilities. Call Hector Arena at (902) 485-5122 for more details and to look into upcoming tournaments. Pickup Hockey on Ice Looking for a casual game of hockey? Hector Arena Ice Skating Rink offers pickup ice hockey for all ages.Give Hector Arena a call at (902) 485-5122 to inquire about their pickup hockey schedule if it is not listed in the description or schedule here. Birthday Party or Event Planning? Why not have your party or event at Hector Arena? They can make their rink and other facilities available to you for birthday parties, holiday parties or corporate events. Their prices are great. They would love to have you out. Give them a call if you would like to schedule your event now at (902) 485-5122. Please call at least one week in advance to properly schedule your event. Snack Bar Got the munchies? Hector Arena provides food and beverages in the snack bar. One of the best ice skating rinks in Lantz, NS, East Hants Sportsplex Ice Skating Rink is a 1 sheet indoor ice skating rink is open seasonally. It was founded in 1940. Public Skating Ice skating sessions for All Ages are one of the main attractions at East Hants Sportsplex. Ice Skating provides great exercise and an opportunity to get out of the house – plus, it is not like exercising at the gym… skating is fun! Lace-em up and come join the others. Get on the ice and get ready for a great experience. If you do not see the rinks public ice skating schedule posted, be sure to contact them at (902) 883-9906 for their public session times. And please tell them that you saw them on RinkTime. And remind them to keep their schedule updated on the site. Figure & Ice Skating Lessons. Are you an adult looking to learn to ice skate? Do you have children yearning to ice skate like the pros? If so, the folks here love to teach and their instructors are top notch. For beginners they usually focus on providing the basics. For more advanced skaters they focus on proper form, technique and getting you ready to meet your goals. Call East Hants Sportsplex at (902) 883-9906 for more details. Ice Hockey Leagues East Hants Sportsplex Ice Skating Rink offers ice hockey leagues for all ages. Whether you are a beginning skater looking to play on a team in an instructional league or an experienced ice hockey player looking to get out and play with others of a similar caliber, East Hants Sportsplex Ice Skating Rink is the place to play. Give them a call at (902) 883-9906 to inquire about their leagues now. The experienced group will help get you ready for your next game Leagues and levels include: Adult,Youth. Ice Hockey Tournaments What better way to see how you and your team stacks up than to play against teams outside your normal leagues? East Hants Sportsplex Ice Skating Rink hosts ice hockey tournaments forall ages.at their facilities. Call East Hants Sportsplex at (902) 883-9906 for more details and to look into upcoming tournaments. Ice Hockey Camps and Clinics With the exception of private lessons, the best way to increase your hockey skills is to do drills and exercises that build on the fundamentals. Even better is to do those drills while supervised by someone who understands how to do things properly and can correct you when you are doing them wrong. When playing, everyone feels like they are NHL ready, but very few really look or play that way. East Hants Sportsplex Ice Skating Rink offers camps and clinics for all ages.to help you improve your game. Call East Hants Sportsplex at (902) 883-9906 to learn when their next ice hockey camp or clinic is being held. Pickup Hockey on Ice Looking for a casual game of hockey? East Hants Sportsplex Ice Skating Rink offers pickup ice hockey for all ages.Give East Hants Sportsplex a call at (902) 883-9906 to inquire about their pickup hockey schedule if it is not listed in the description or schedule here. Birthday Party or Event Planning? 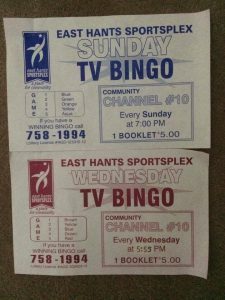 Why not have your party or event at East Hants Sportsplex? They can make their rink and other facilities available to you for birthday parties, holiday parties or corporate events. Their prices are great. They would love to have you out. Give them a call if you would like to schedule your event now at (902) 883-9906. Please call at least one week in advance to properly schedule your event. Snack Bar Got the munchies? East Hants Sportsplex provides food and beverages in the snack bar.